I'm loving this in-between-seasons weather. Each morning I wake up, I don't know if it's going to be rainy or sunny; some days it's been both! I can curl up under a warm blanket with my morning coffee and still enjoy the beautifully blue, sunny day that awaits. My cat, Bean, spends most of her days windowsill hopping, soaking up every glorious ray of sunlight she can. The thing I've enjoyed most, though, has been the meddling of seasonal flavors. When I set out to make the most amazing chocolate chip cookies possible, I kept this in mind, and was reminded of this lovely little coffee shop right down the road from our farm. They offer lavender mochas and orange mochas, both of which are so good, I often have trouble deciding between the two. Then it hit me: Lavender. Orange. Chocolate. Chip. Cookies. Yes! It was genius! Why had I never had this before? I know lavender isn't for everyone; for some it can be too reminiscent of soap. It is definitely a flavor where a little goes a long way. When coming up with this recipe, I knew I didn't want the lavender to overpower the cookie. I wanted it to be the neat little bow wrapped around the gift that is chocolate and orange together. I decided the best method of incorporating it into my dough would be by infusing the butter beforehand, creating a compound butter. Compound butters are ridiculously easy to make, and a great way to add fresh herbs and other flavors to your meals. This particular butter would be perfect for shortbread, spreading on muffins and pancakes, perhaps even as the finishing touch to a roast chicken! The possibilities are endless, really. I found out that to get a really soft, chewy cookie, you have to do a few important things. First, you're going to want to underbake your cookies. I know it seems wrong, but you'll have to trust me on this. 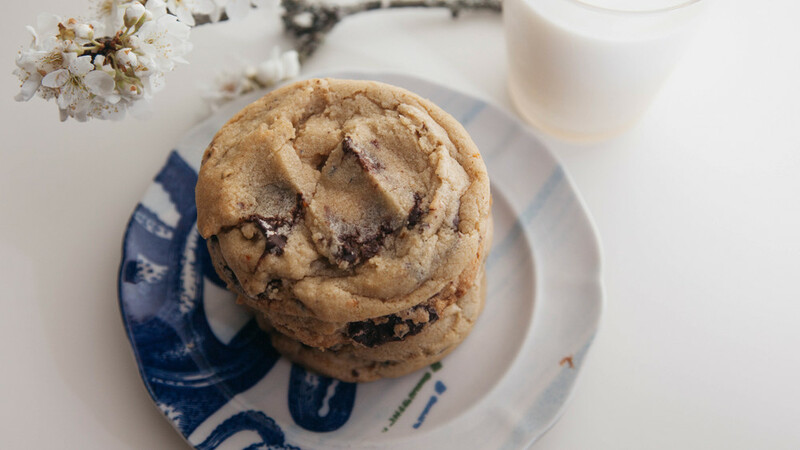 As your cookies sit to cool on the cookie sheet, they'll continue to bake just a tad longer, giving you the perfect texture. Next, (and this part may actually be more important than the first,) you need to chill your dough. Putting the dough into the fridge for a few hours before baking helps to control the spreading of the cookies, making sure you don't end up with flat, dark, disappointments with thin, crunchy edges. If you're really impatient like I am, a quick half hour in the freezer will do the trick as well. I scooped my dough before chilling so my cookies would really retain their puffy, round shape when baked. This is quite possibly the softest cookie I've ever eaten. I'm not kidding. The edges are just crisp enough to give a satisfying bite, but then they give way to the pillowy center chock full of gooey chocolate. I found the hints of bright and shiny orange zest causing involuntary smiles as I took another bite. Last but not least, lingering near the back was our Lady Lavender. So gentle and slightly mysterious, she's the reason you go back for another cookie....or three. I'm so glad this recipe makes such a generous batch of cookies! Where do you stand on the age old debate of Best Cookie Ever? Are you a true chewy fan? Need a satisfying crunch? Make your case for your favorite in the comments section below! Before I go, (I may or may not be sneaking off to grab another cookie...) I'd like to invite you to check out Margaret Moon's new Facebook and Instagram pages! Like, Follow, Pin, and Share my adventures in baking and help me reach out to new readers! This recipe requires a lot of downtime, both in making the compound butter and chilling the dough before baking. Both can be made a day prior to baking to speed up the process. Preheat oven to 350F. Line cookie sheets with parchment paper or silicone baking mat. Whisk together flour, cornstarch, salt, baking soda, and baking powder in a medium mixing bowl; set aside. In a small mixing bowl, add the orange zest to the granulated sugar, using your fingers to rub together until the sugar is slightly damp and fragrant; set aside. In the bowl of your mixer, beat the softened butter on medium speed with the paddle attachment until smooth. Add both sugars to butter, creaming together until pale and fluffy, about 4 minutes. Add the vanilla, egg and yolks one at a time, beating until mixed throughout. Scrape the sides and bottom of your bowl with a rubber spatula to make sure everything is fully incorporated. With your mixer now on low, add in your dry ingredients slowly, mixing until almost fully combined. Add in your chocolate chips, mixing until just barely combined. Using a scoop or spoons, drop balls of dough onto lined cookie sheets, leaving about an inch of space between each ball of dough. Chill dough balls in refrigerator at least one hour, preferably longer, to chill. Alternatively, dough can be placed into freezer for 30 mins before baking. Bake chilled cookies about 10-12 mins, rotating halfway through. Cookies will be underbaked, but ill continue baking on the sheet as they cool. Let cookies cool on sheet for about 5 mins before transferring to wire cooling rack to cool completely. Store cookies in an airtight container. In a medium mixing bowl, break up the sticks of softened butter with a wooden spoon until mostly smooth. Add the crushed lavender and orange zest, mix throughout. Turn the butter out onto a long piece of wax or parchment paper, using the paper to flatten and shape into a long rectangular shape. Cover the butter with one edge of the paper and begin rolling tightly into a log shape. Twist each end closed as you would a piece of candy. Place log into fridge or freezer to set up for several hours or overnight.